Leyte Governor Leopoldo Dominico “Mic” L. Petilla recieve a key from Dato Dr. Ahmad Faizal Mohd Perdaus president Mercy Malaysian during the turn over of one unit Ambulance and the rehabilation of O.R. and D.R. of the Leyte provincial Hospital on March 6,2014 held at the Leyte provincial hospital grounds Pawing Palo,Leyte. TACLOBAN CITY – Mercy Malaysia , a Malaysia-based non profit organization, recently donated an ambulance to the Leyte Provincial Hospital (LPH) and signed an agreement with the provincial government for the construction of the intensive care unit of the Ormoc District Hospital (ODH). Leyte Gov. Leopoldo Dominico Petilla expressed his elation on the benevolence of the Mercy (Medical Relief Society) Malaysia saying that rehabilitation and rebuilding efforts being conducted by foreign organizations are big help to the provincial government. “Indeed, rehabilitating our hospitals entails a lot of funds. But thanks a lot to helpful and kind donors here and abroad, such as Mercy Malaysia, we are able to reconstruct and rehabilitate our hospital and little by little get our services back to normal,” Gov. Petilla said. “With many of our facilities devastated, we can only do so much, and our budget can only stretch as far. With the generous support of the Malaysian people, our recovery efforts, especially among our hospitals, are accelerated,” the governor added. The LPH and the ODH were among the provincial-government run hospitals that were badly hit by supertyphoon Yolanda in November, 2013. 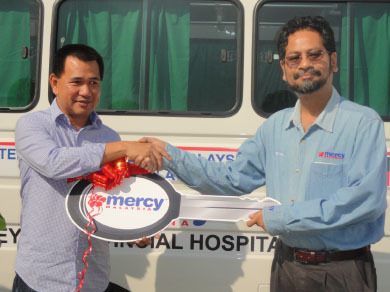 It was learned that before this ambulance donation and the new agreement, Mercy Malaysia readily extended its help to the ODH just days after the typhoon. The said group has deployed a field hospital within the grounds of the severely damaged ODH. The field hospital functioned as an outpatient department as well as a temporary emergency department while the original hospital was being repaired. All that was left of the 100-bed hospital after the typhoon was its emergency unit.